The Epson SureColor SC-F6000 is a strong contender in the dye-sublimation market, featuring a smaller print width of 42in it enables users to expand into the soft signage industry without breaking the bank. Designed and built by Epson for quality, reliability and performance the Epson SureColor SC-F6000 has a low total cost of ownership, helping users increase their business offerings. It incorporates Epson UltraChrome DS inks which not only provide high quality colour reproduction with sharp contours and intense blacks but also gives better abrasion/ perspiration resistance and excellent light/ wash fastness. Epsons print head technology and inks combine to minimise ink usage while reducing power consumption. 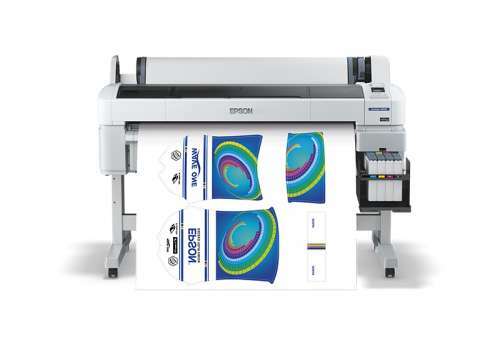 The Epson SureColor SC-F6000 is both durable and robust which can handle all major dye-sublimation transfer papers for a wide range of polyester applications. This gives business the opportunity to produce stunning banners/ flags, and other soft signage applications.